Considered by most to be a backward, unsettled. land of monsters, jungles, disease, and savages, the Chultan peninsula boasts several distinct cultures and relatively stable governments that date back hundreds of years. These lands' reputations derive from their isolation from the rest of the world, the magical concealment of key cities, and the fever-induced rants of old sailors. 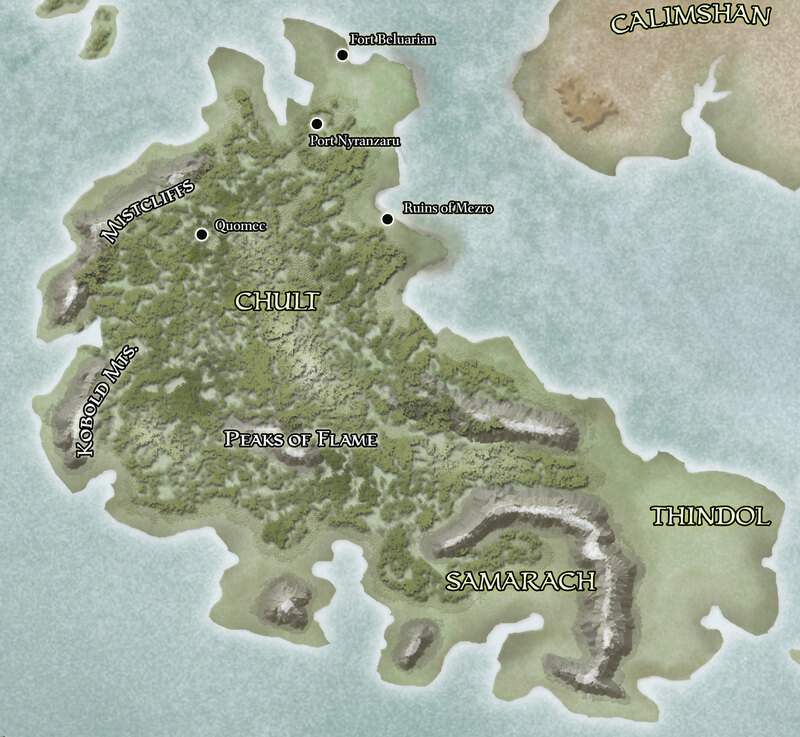 The Chultan peninsula encompasses the land from the Mhair Jungles westward, including the Black Jungles, the jungles of Chult and the countries of Tashalar, Samarach, and Thindol. Located at the westernmost end of the Chultan peninsula, Chult is a mountainous jungle of savage beasts, hulking dinosaurs, and disease-ridden swamps. Reclusive human tribes, fierce goblins, and strange monstrous folk haunt this dangerous land. Nevertheless Chult draws adventurers who search for its legendary riches. Faith in the many aspects of the deity Ubtao holds dominion in this land, for the divine powers of Faerûn awarded Ubtao the land of Chult in exchange for his vigilance over the threat from under the Peaks of Flame. The humans of Chult live in small tribal villages of ten to fifteen family units, moving yearly when the poor soil becomes depleted. They use weapons that don't require much metal, such as handaxes, bows, clubs, halfspears, bolas, knives, and shortspears. Iron and steel are too rare for the Chultans to produce metal arm or in any quantity, so their warriors wear hide breastplates and carry large, oval shaped hide shields. Tribal custom restricts the practice of sorcery and wizardry among the rural clans, although people with an aptitude for magic are as common in Chult as they are anywhere else. Only one wielder of arcane magic is permitted to practice his or her craft in an given clan or village. These sorcerers and wizards participate in hunting ceremonies and brew potions to aid the warriors. Renegade mages hide in the jungle and study magic in secret, or abandon their home villages to travel to the college in Mezro. The Chultans distrust power and wealth, preferring to live simply and trading excess valuables for useful goods. Other than the humans, intelligent creatures living in large numbers in Chult include the Batiri (tribes of green-skinned goblins skilled at trading), wild dwarves, lizardfolk, pterafolk, and yuan-ti. Less common are aarakocras, chuuls, hydras, nagas, troglodytes, trolls, and wyverns. The natives greatly respect the dinosaurs, which have a special place in local mythologies and are sometimes worshiped as aspects of Ubtao. Many wealthy warriors or chiefs own weapons of good steel acquired from northern traders, but weapons made of stone, wood, obsidian, or copper are not uncommon in Chult. Weapons made of inferior materials suffer a -1 penalty on attack rolls. No Chultan armorers work in heavy metal armors, due to the scarcity of iron and steel and the hot, humid conditions of the peninsula. Any character wearing armor that has an armor check penalty of -5 or worse for more than an hour becomes fatigued as if she had slept in armor (-1 penalty to Strength and Dexterity cannot charge or run). She remains fatigued as long as she wears the armor and for 1 full hour after she removes it. Chultan hide breastplates are equivalent to leather armor and hide shields are equivalent to large wooden shields. The famous jungles cover most of the western end of the Chultan peninsula. Only the highest mountains rise clear of the verdant growth, although great, marshy clearings and grasslands surround large lakes in the interior. The Jungles of Chult: If one listens to tavern tales told across the rest of Faerûn, it's hard to escape the conclusion that the jungles of Chult are the deadliest places on all Toril. Every bush and vine is a strangling, poisonous, flesh-eating, or brood-sucking monster and under every bush lurk a thousand scaled, taloned, fanged monsters. These tales aren't far wrong. The heat and humidity is incredible, and the insects are everywhere, clinging and stinging, their noise unceasing. The trackless jungles are home to strange tribes of dwarves and scaly folk found nowhere else. Land leeches, carnivorous plants, and giant slugs are all too common, and every serpent seems to be armed with deadly venom. Disease is the deadliest killer of Chult. It is carried in plants with stabbing spines, or in any of the hundreds of insect bites suffered in a typical day, or even borne by jungle mists. Those who drink unboiled jungle water are almost certain to acquire some sort of disease or parasite before long. Travel in the "deep canopy" jungle is easiest, though not without danger. Here giant solifugids, ants, spiders, carrion crawlers, and purple worms slither and scuttle in the everlasting, vine-hung, fungus-filled gloom beneath the hundred-foot-tall trees, where the sun never reaches. At least the undergrowth is sparse, and the alert traveler can see hungry death coming. 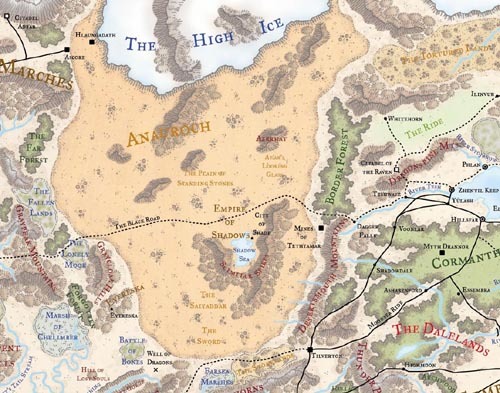 Yet explorers from elsewhere in Faerûn enter Chult again and again in search of its fabled veins of gold, gems as large as a man's palm, exotic plants prized by collectors in Amn, Calimshan, Sembia, Tethyr, Thay, and Waterdeep (and sources of poisons, perfumes, and medicines by the score), huge jungle timbers, and even rubber trees. Chult's riches are not exaggerated in the slightest. Satraps of Calimshan send a constant stream of slaves into the jungles to carve roads through the fast-growing vines and creepers and reach known mines and ruined cities. Most perish, but a few escape to tell colorful tales of extensive caves underlying the jungles haunted by gigantic bats or cloakers, and of ruined cities choked with coins and gems and lurking monsters, where only vines hold up the crumbling stones and weird six-headed snakes slither and even fly. They speak of the fabled city of Mezro, where the Chultan priest-kings dwell, worshiping strange deities... and of the eerie creatures known as deepspawn that vomit forth living duplicates of creatures they've devoured before. Peaks of Flame: Home to salamanders and other fiery creatures, the Peaks of Flame stand over a pair of iron doors that lead to the realm of the dead. When the doom of the world approaches, Dendar the Night Serpent (a terrible monster that feeds on the unremembered nightmares of all creatures) will break down these doors and escape into Toril. Valley of Lost Honor: A place surrounded by the thickest parts of the jungle, this valley was the last refuge of the Eshowe (see Regional History, below) before they were destroyed. The entire wealth of the Eshowe may be hidden in caves here, but other legends say that the evil deity Eshowdow (Shar in another guise) resides here, recruiting followers and planning for revenge. The surrounding jungle teems with great numbers of Batiri and natural predators. Wild Coast The rocky, inhospitable stretch of Chult's southwestern coastline creates a hazard for ships. Sailors give it a wide berth, for whirlpools, shifting gale-force winds, and aquatic monsters are all common, and above, flying dinosaurs battle giant eagles for supremacy of the skies. Brave or foolish folk explore the caves along the coast, hoping to find tunnels leading to the rich mines that lie under the jungle. Despite the dangers from the jungles, determined folk still manage to carve out civilized areas for themselves and for visitors to the country. Fort Beluarian (Hamlet, 313): This outpost belongs to the Flaming Fist, a mercenary company based in Baldur's Gate. Its membership includes rangers, wizards, clerics, and a large number of fighters who hire themselves out for any venture that doesn't serve an evil purpose. They are well supplied and familiar with the jungle, and they even let desperate adventurers stay in the fort for the night if in great need. Mezro (Metropolis, 18,126): Mezro is the largest civilized area in Chult. In past years, a magic wall surrounded the city, preventing it from being seen and causing confusion in those who approached too closely. This protection was lowered in 1363 DR after a victorious battle against the Batiri goblins. It is now a safe haven for explorers battered by the jungle. Mezro is a holy city to the Chultan tribes, and it is generally peaceful, with few people carrying weapons other than utilitarian knives. Any chronic lawbreaker is tattooed with a blue triangle on the forehead and exiled. Ubtao's undying baras, six paladin-like Chosen who exist to protect the city from all harm, rule Mezro. The city has its own college of wizardry, although it is generally closed to non-Chultans. After studying at Mezro for several years, wizards generally go back so their native tribes. Only rarely do Chultan mages travel to the other regions of Faerûn to find their fortunes. Port Nyanzarn (Small City, 9,375): The major trading center in Chult, this port town's harbor was designed with defense as its first priority, since many pirates roam these waters. It is rumored that the harbormaster pays tribute to a powerful dragon turtle that drives away all other sea monsters. Millennia ago, the deity Ubtao created the jungle and populated it with creatures. Four thousand years ago he built the city of Mezro with his own hands and empowered the baras - his Chosen - to defend it. Eventually Ubtao tired of the constant demands of the people in the city and retreated, allowing the baras to rule Mezro in his stead. Realizing that the act of creation had distanced him from mortals, Ubtao imbued a portion of his essence in the land, creating nature spirits and inadvertently drawing the attention of a dark shadow. A tribe of humans called the Eshowe freed this shadow-creature, Eshowdow, who attacked Mezro only to be driven back after causing great destruction. In retaliation, a bara called Ras Nsi hunted down and killed the entire Eshowe people. Most Chultans have forgotten the Eshewe and Ras Nsi's ancient crime. Several years ago, the undying King Osaw (LG male human Pal15), Chosen of Ubtao) opened Mezro to, the outside world again. Trade goods now flow back and forth to the rest of Faerûn. As noted above, unimagined treasure waits in the jungles of Chult... and mortal peril, too. Choosing to search for the one despite the risk of the other is what separates adventurers from the common folk. Dragons of the Coast: Dragon turtles lurk in the sea near the river outlets, seeking prey and tribute. Local interests hire heroes to kill or distract some of these creatures so that valuable shipments can escape unhindered. To sweeten the pot, certain wizards require dragon turtle parts for exotic spells or magic items and would pay dearly for carcasses. Fallen Champion: The renegade bara Ras Nsi was exiled long ago for his ruthless extermination of the Eshowe. He still maintains a twisted devotion to Mezro and violently disagrees with Osaw's opening of the city. Driven by determination to save Mezro from its misguided rulers, Ras Nsi has raised an army of undead to throw down his former fellows and drive all outlanders out of Chult. More civilized than Chult and more friendly than Calimshan, Tashalar is an exotic land of strange food, beautiful people, and great wealth. The skilled craftsfolk mate excellent crossbows and fast ships. The accomplished hunters keep trophies of their most dangerous kills. The people of Tashalar live on the strip of friendly coastline along the southern Shining Sea, avoiding the Black Jungles and entering the Hazuk Mountains only occasionally to mine for gold and iron. Tashalaran grapes are so perfect that even the worst Vineyard produces wines worth a hundred gold pieces in Waterdeep. Overshadowing this wealth and splendor are the Rundeen consortium that puts a chokehold on trade and the evil yuan-ti that haunt the jungles. The larger towns of Tashalar (small city-states, really) are home to wealthy and ostentatious merchant families. The "princes" of these families control the merchant consortiums that rule the country. Those common folk who don't make their living in the fields, groves, or vineyards work as sailors, shipwrights, sailmakers, and provisioners. Hunting is a popular sport, with the bravest hunters seeking out the deadly denizens of the jungle. Spicy food and strong wine are the typical dining fare. The folk of Tashalar obsess over the future, and every adult owns at least one set of cards or plaques used for personal divinations. (Wealthier folk own ones made of silver or ivory.) The people see the hand of Savras the All-Seeing in their daily card readings, numerology, and astrology. Tashalar is a warm but breezy country, with open land covered in vegetable gardens, olive groves, and vineyards. Black Jungles: These jungles are home to three large tribes of yuan-ti, one of which has allied with the Rundeen consortium. The Sesehen tribe provides exotic herbs and poisons to the Rundeen in exchange for slaves and transport of pureblood spies to northern ports. The jungle has connections to the Underdark, and one temple to the snake god of the yuan-ti contains a portal to a similar place in Hlondeth in the Vilhon Reach. Mhair Jungles: Remnants of an old yuan-ti empire still live in isolated pockets of these vast, sparsely settled jungles. Bloodflower, a rare herb extinct everywhere else in Faerûn, is harvested here to be made into a potent healing salve. The jungles also hold wandering groups of wild dwarves (survivors of a lost kingdom) who trade enormous green spinel gems, but carefully guard the secret of where they find them. The city of Tashluta is the largest of the Tashalar city-states and the most welcoming to visitors to the nation. Tashluta (Metropolis, 51,522): The capital of Tashalar is the common port for visitors, as only here do the locals make any effort to learn the other languages of Faerûn. They enjoy playing jokes on foreigners, usually involving incredibly spicy food. The city has a ban on snakes of all sorts, and the Tashlutans kill any that are discovered. Long ago, a great mercantile empire called Tashtan ruled the central part of the Chultan peninsula. As a result of many battles with Calimshan and jungle plagues, Tashtan dissolved into smaller nations, the northernmost being the collection of city-states now known as Tashalar. A strong mercantile kingdom, Tashalar protects its border with fleets of strong ships, most of which have fallen under the influence of a consortium of aggressive traders known as the Rundeen. The Rundeen reaches into Calimshan through a partnership with the Knights of the Shield, an organization of spies active in Amn, Calimshan, and Tethyr. Tashalaran vessels now sail to ports in Calimshan and the Lake of Steam, bringing unusual goods to recipients elsewhere in Faerûn. Adventures in Tashalar generally begin in the city of Tashluta through the uncharted reaches of the mountains and jungles may entice adventurers looking for places not often explored. Fighting for the Crown: Assassinations and blackmail of the ruling families' princes are believed to be the work of someone wishing to install a single noble as figurehead-ruler of Tashalan. Most think members of the Rundeen or the yuan-ti are involved, with several less-influential merchant families. All sides have begun hiring mercenaries and adventurers for protection and to make counterattacks on their suspected enemies. Risen: A long-sunken ship, festooned with seaweed, its crew no more than slumped heaps of coral-encrusted bones, rose from the sea bottom outside Tashluta's harbor and sailed into the docks, causing much terror. Tashlutan authorities towed the ship to a private and refused to announce its contents. The next morning all of the skeletal crew were gone, and several people have since been found dead in the streets. Little is known about this kingdom, since it is separated from rest of the peninsula by thick jungle and rugged mountains. Explorers from Tashalar claim it is populated by cowards who barricade themselves in walled cities at night. The natives cloak the paths to their cities and the passes through the mountains with illusions. Expanses of tall grass cover this land, home to a race of humans similar to the Chultans, but renowned as incredibly fleet of foot. In the hills and mountains live gold dwarves, their caverns ringing with the sound of weapons being forged to fight the hordes of kuo-toa that live in the waterlogged tunnels underground. The kuo-toa are allied with yuan-ti that have the traits of swimming snakes.